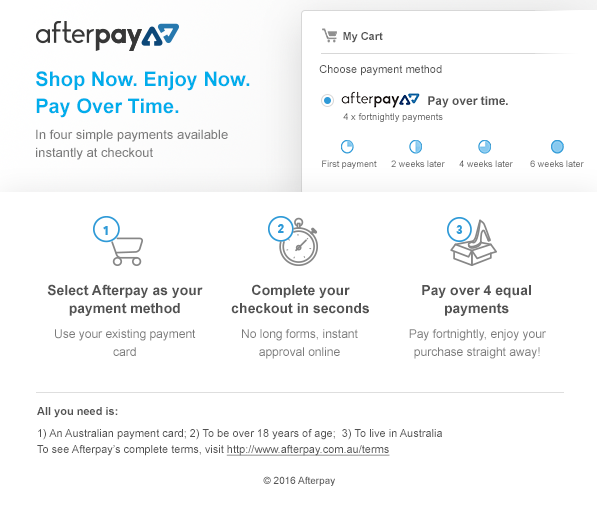 Afterpay offers interest-free payment plans for online purchases. Buy and receive what you want today and pay it off in four equal instalments fortnightly. If you are using AfterPay for the first time, you will be charged your first instalment at the time of purchase. If you are an existing AfterPay customer, you will be charged your first instalment 14 days from the date of purchase. After the purchase is made, the payment schedule will be provided to you. *If you fail to make payment, you will be charged a late fee of $10. If the payment remains overdue, an additional $7 will be charged to you one week later. This fee is taken by Afterpay, we are unable to assist with any enquiries relating to fees. If you would like to return your item our normal Returns Policy applies, please see our terms and conditions for more info.